Make every family feel welcome by inviting parents from different cultures to share their language, heritage, and stories in after-school programs. These days, it's not uncommon for me to hear the words "Konnichiwa, Roach-san!" echo down the hallway at the Granger, Indiana school where I coordinate the after-school enrichment program as a PTO volunteer. Beyond just celebrating culture, those konnichiwas signify that my school is leveraging diversity to enhance learning. Our origami class was born at a back-to-school night when a fifth grade mother thanked me, in emergent English, for speaking out in support of smaller classes. As the conversation came to an end, I asked Mrs. Kawachi if she would teach an after-school origami class. Although she was convinced that her English skills were insufficient, the parent felt honored by the invitation and said she'd ask a Japanese friend or two if they would be willing to help. Mrs. Kawachi enlisted two other mothers, Mrs. Uchiyama and Kansas-born Mrs. Rooney, who spent a year teaching English in Japan. They collected delicate paper, identified a variety of origami projects, found short videos that brought the culture of Japan to life, and selected Japanese phrases for the students to learn. The origami class was such a hit that the parent team offered it again during our winter session. Activating the talent and expertise of our Japanese families realized benefits far beyond the origami class. Mrs. Kawachi and Mrs. Uchiyama became acquainted with other parents and community members involved in the enrichment program at an end-of-session celebration and during the PTO thank-you breakfast. That led to a parent inviting them to her home for lunch. Ultimately these gestures helped Mrs. Kawachi and Mrs. Uchiyama feel less like guests in the school community and more like involved, impactful parents. 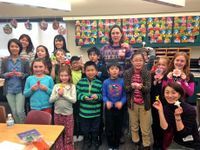 These positive experiences and interactions empowered Mrs. Kawachi and Mrs. Uchiyama to advocate for other ELL children. When a new Japanese family arrived in the middle of the school year, the origami instructors worked with the principal to encourage these children to sign up for their after-school class, where they could show off Japanese culture as experts while experiencing the comfort of using their own language in a classroom setting. Finally, and perhaps most importantly, my invitation to Mrs. Kawachi and Mrs. Uchiyama persuaded the larger school community, especially the PTO, to consider other ways to tap the talent and expertise of its diverse families. A Nigerian father was asked and agreed to lead the first grade "art smart" lesson on African masks next month. He plans to bring in a treasure trove of artifacts. As for after-school enrichment next year, a few moms in the Indian community have a course up their sleeves that will explore Indian culture, complete with henna painting lessons, Bollywood movies, and Hindi expressions. Maybe next fall I'll hear "Namaste!" echo down the hallways. Educators and engaged parents will fail to realize the full value of cultural richness if we wait passively for it to emerge. The lesson from this after-school origami class is that cultural richness should be cultivated as well as celebrated. The cost of kind gestures and invitations to diverse families is small, but the dividends can be immense for those families, for a school's educational programs, and for the entire school community. 1. You can't use assets that you don't know about. Send family surveys (MS Word) at the beginning of the year asking parents about their talents, languages, experiences, and expertise. Solicit specific expertise. For example, a school newsletter might highlight that the second grade is exploring weather this month. Ask members of the school community to contact a teacher if they have lived through a hurricane or typhoon. 2. Provide multiple ways for students and families to showcase their rich traditions. Trophies aren't the only things that can be displayed in a school's entryway. Invite students and families to fill trophy cases with artifacts (MS Word) from their cultures. After-school enrichment classes should tap into children's natural curiosity for language and culture. Turn your standard dance class into a "dance around the world" class. Set time aside to celebrate the cultural richness of your community. Plan a culture night. 3. Leverage your social capital. View the PTO as more than a fundraising board. Parents active in the PTO have many community contacts that can be activated. Identify parents to serve as school ambassadors for diverse groups. In many cultures, families don't feel that it is appropriate to build relationships, albeit respectful ones, with teachers and school leaders. A fellow parent reaching out, however, is a different story. Enlist friendly parents representing many cultures to serve on a welcoming committee and to make sure there are parents that speak a multitude of languages present at school events. What strategies and events does your school employ to invite contribution from families of diverse cultures?